Happy September everyone! 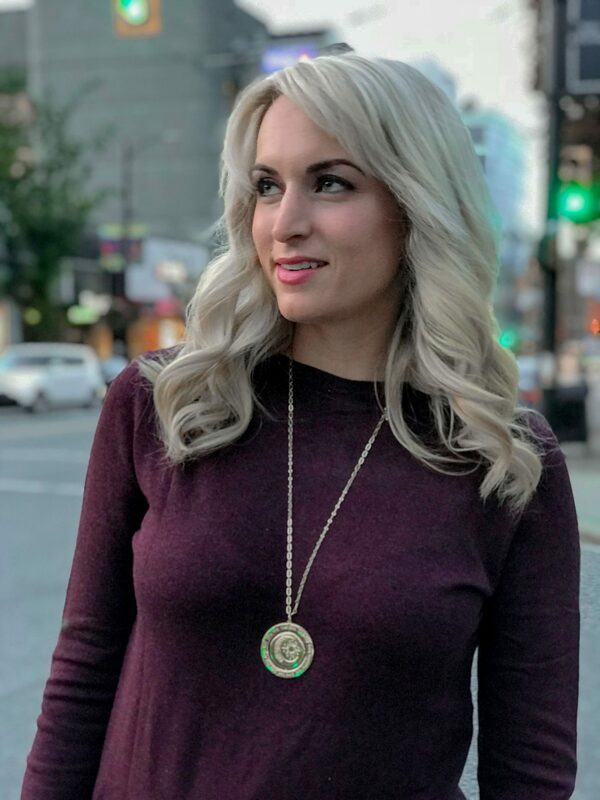 This is my last day of work before heading out to New York Fashion Week (leaving on the red eye tonight) so I wanted to talk stylish fall work wear, and share my new favorite outfit for a day in the office. The best part about this outfit is that yes; you can buy all of these pieces if you love them (links are below!) but it with one easy trick that you can do with your existing clothes you can create a stylish fall work wear look and make your work day style more trendy. The trick? Try wearing a basic cardigan backwards! From the front it looks like a typical crew neck sweater, but the buttons down the back add some fun detail that is professional, but trendy. I went recently got this burgundy / wine colored button down cardigan and I love it. As usual, burgundy and other dark jewel tones will be popular this fall, so I wanted to add a cardigan in this shade to my wardrobe. I love how well it brings out the burgundy stitching in these wide leg pants. I am so in love with these pants! I rarely wear flats or low heels (as you’ve probably noticed haha) but the wide leg flood cut of these pants looks so good with flats that I had to make an exception. So okay; fine. These still aren’t flats with their small block heel, but these are probably the closest thing I own to flats sooooo yep. haha. Between the open sides, the tassel detail and the rhinestone studded block heel, these “flats” are definitely fashion forward. What I love about them though is you can pair them with a classic outfit and they can be completely work appropriate. Last thing I want to talk about – backpacks! I have been hesitant to get on board with this trend but now that we are seeing more and more mini backpacks in faux leather materials, I am definitely finding myself more drawn to them. This studded backpack is one I picked up at Primark in Amsterdam last month and I know i will be styling it all this fall. Such an easy addition for stylish fall work wear. I’ve linked up a similar backpack if you are on the hunt! 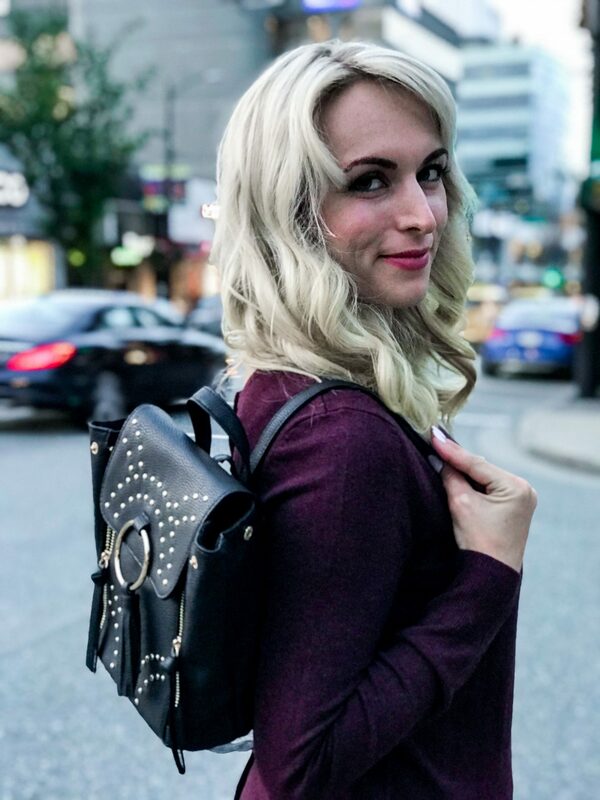 A faux leather studded backpack is an on trend item that you can add to your wardrobe and really elevate your work day style. Since I always have court files on me, I always have to have a briefcase; but I will be adding backpacks into my work day wardrobe as they are great to take when popping in and out of the office to grab coffee etc. And with that- I’m off to prep for New York Fashion Week!! Peace out Vancouver! To follow along with my NYFW experience follow me on instagram as I’ll be doing stories throughout. "The Vacation Every Young Professional Needs to Take: The Yacht Week"
"A Bit of Paris in New York"
Those shoes are gorgeous!! And this is such a stylish workwear! Arent they so cool! i love what a statement they make. And thank you! Obsessed with these shoes!! I’m heading out to NYC tomorrow, maybe I’ll see you around! I can’t believe it’s already September!! Love those pants and how you styled them. So fun for fall! I love this look from head to toe! It’d be perfect for NYFW. Especially the backpack! Love this look!!! Those shoes are darling! I can’t wait to follow along for FW!! This is such a great transitional outfit! I love those pants for fall. Dying over your accessories! That backpack and those shoes. So good!!! You totally should! It’s such an easy way to change up your look. I don’t have a corporate job but this outfit looks classy and perfect for those who do. I love your check trousers, and those shoes are amazing! Hope you have a great time at NYFW! They’re so fun eh! And thank you so much, I’m having a blast! Those shoes are so fun! I love the sparkly accents! Perfect for fall and for the office. Thanks girl!! My thoughts exactly!